As sneaker culture grows, the demand rises. And with sneaker brands continually releasing extremely limited runs of highly coveted kicks, it creates a massive opening in the market for replica productions to capitalise on. Right now, the black market for fake sneakers has never been bigger. Counterfeit creps have become almost impossible to spot, with both production factories and importers going to incredible lengths to please the market. In fact, earlier this month, a trio of men were charged for their role in a $73 Million counterfeit operation. 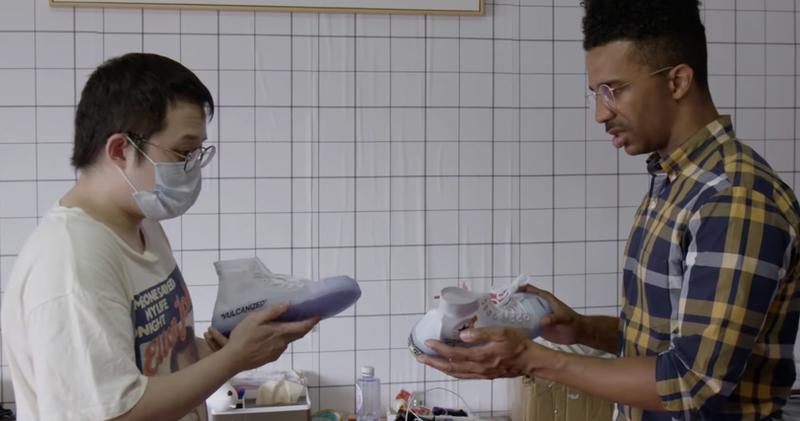 To see just how big the black market industry ahas gotten, Vice News did some investigating on-site in Putian, China, which is known to be the Counterfeit Crep Capital of the world. In the video below, Vice catch up with a man, only known as Chan, a Chinese seller who specializes in acquiring fakes that are almost impossible to tell apart from the real deal. Chan runs his business from a small apartment stacked wall-to-wall with bootlegs His stash includes Off-White x Nikes, Yeezys, Balenciagas, and nearly every other in-demand sneaker of the moment. He claims that local law enforcement tend to look the other way (we’re sensing bribes, but that doesn’t stop the man from covering his face. Chan claims his business was booming to the extent that he was moving as many as 120 pairs of shoes daily while living in the U.K., raking in an average of $100,000 per month. His business got so bigm that he had to relocate to Putian to be closer to the product. Take a peep below. It’ll blow your mind.